Lily Lemontree: THE ROYAL PARADE: To Grandmother's House We Go! THE ROYAL PARADE: To Grandmother's House We Go! Just over a month old and Prince George Alexander Louis of Cambridge is already on the move. 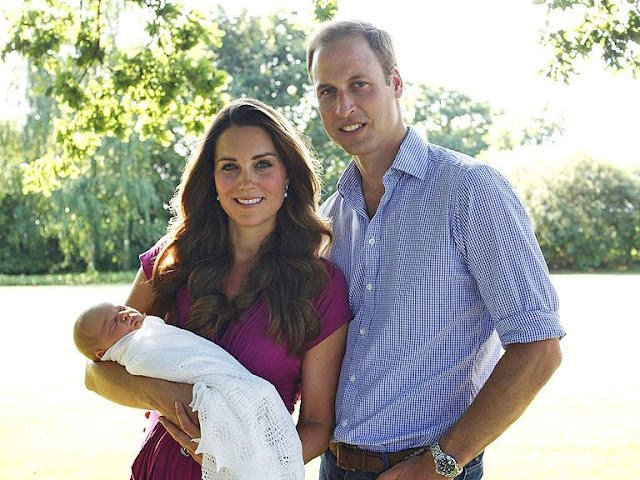 After spending his first few weeks as royal infant in the comfort and safety of the Bucklebury home of Michael and Carole Middleton, his maternal grandparents, the tiny heir to the British throne is off and headed to Kensington Palace, his other grandmother’s old stomping grounds. Kensington Palace has been in the British Royal family’s real estate pocket since 1689, when the then-reigning joint monarchs William and Mary, needed to find an alternative to Whitehall Palace, the customary residence for king and queen at the time, due to the asthmatic William and the geographical location of Whitehall Palace near the River Thames not mixing well. Since then, Kensington Palace has had its share of famous regal tenants and heirs, including Prince George’s own father, Prince William and has even had a King George or two calling it home (King George II was the last reigning monarch to use Kensington Palace as their permanent royal residence until his death in 1760). 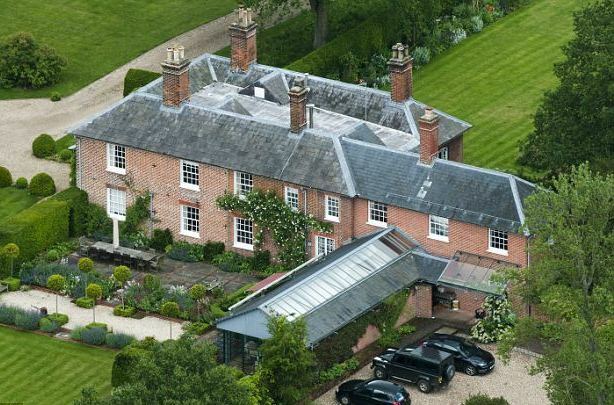 Prince George will no doubt feel right at home in his new digs since his dear old dad will be able to give him the lay of the royal land, having been a resident of Kensington Palace for most of his life. In 1981, after the marriage of Prince George’s paternal grandparents, the Prince of Wales and Lady Diana Spencer, the new royal couple established their permanent residence in Apartments 8 and 9 of Kensington Palace where they raised their sons, the Princes William and Harry. According to a biographer of the late Princess Diana, Andrew Morton states that Kensington Palace is a “children’s paradise” with a rooftop garden, winding secret passageways and a private helicopter pad. After the Wales’ divorce in 1996, Diana, Princess of Wales continued living at Kensington Palace, or KP as she was known to refer to it, until her death in 1997. After her untimely passing, her apartments were reportedly stripped of all her belongings and left unoccupied until recently when they were turned into offices for charities associated with her ex-husband, the Prince of Wales. Situated across a quiet courtyard from Princess Diana’s royal residence, is Apartment 1A, a 4-storey residence contained within the Palace’s walls and the former home of the late Princess Margaret, sister of Queen Elizabeth. It is in this apartment that Princess Margaret lived and raised her family for almost 40 years till her death. 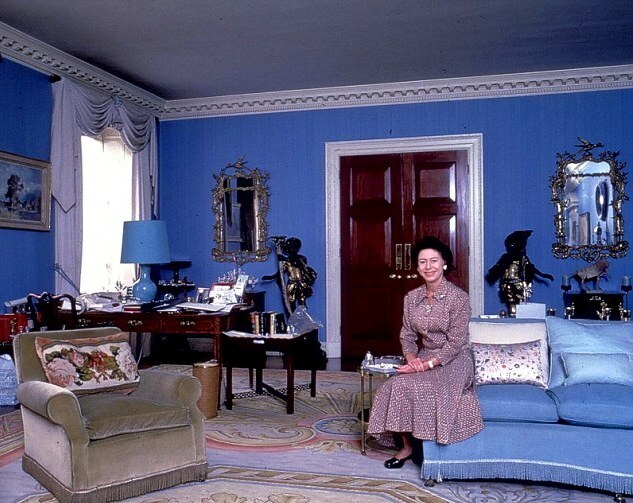 After the passing of Princess Margaret in 2002, the rooms were left undisturbed till 2004 when the Palace opened the apartment’s doors to the public for viewing and private functions. Apartment 1A was set for a little more excitement than it has seen since Princess Margaret’s celebrated social life in the 1960’s, when it was chosen by the Duke and Duchess of Cambridge as their permanent home. 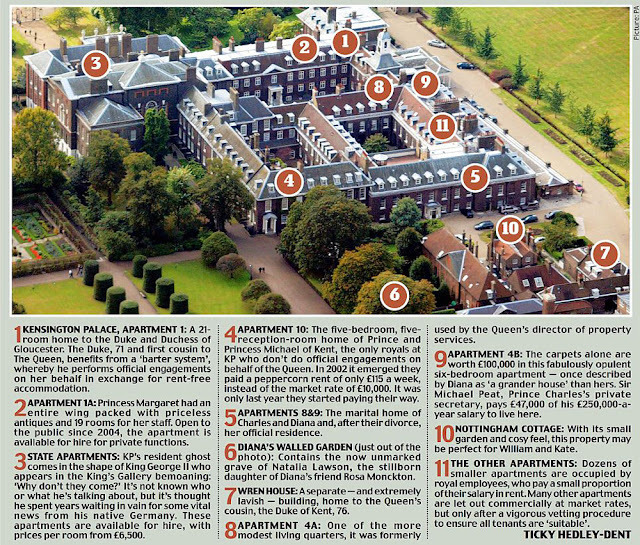 Prince William’s selection of Apartment 1A surely surprised some royal watchers since Kensington Palace was the scene of many unhappy years for Prince William’s beloved mother during the later years of her marriage and separation from her husband. This year, after Kensington Palace has completed a reported $19 million dollar renovation ($1.6 million of those dollars going directly to renovate ‘Apartment 1A’, including removal of old asbestos and updated plumbing) the family Cambridge have scheduled a move to their new regal residence for the month of September. The Duke and Duchess of Cambridge are presently closing out their time spent living in Anglesey, Wales, where Prince William has been stationed as a RAF search and rescue helicopter pilot since 2009. After leaving Anglesey, they hit the road again, making their way to another temporary spot, Nottingham House, a small two bedroom cottage situated on the grounds of Kensington Palace. The Cambridge's will call this small, two-bedroom cottage home before setting permanent roots a stone’s throw away. Once they have taken their leave again, Prince William’s younger brother, Prince Harry will become Nottingham House’s new housekeeper. You've got to hand it to the royals, in their own way they do their best at ‘recycling and reusing’, keeping it green and in the family! Awww, hard not to like these two (three) lovely people. Great post with amazjng history! Thank you! !